2016 Suzuki QuadSport LT-Z50. Picture credits - Suzuki. Submit more pictures. The QuadSport 50 lets the younger generation get stuck in and discover the joy of ATV riding. The 49cc engine provides enough power to be exciting, and with a remote engine tether cut-off, you can always bring things to a safe halt. 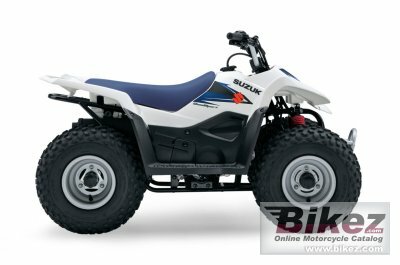 Comments: Designed specifically for younger riders aged 6-12 the 49cc engine with electric starter and scaled-down controls provide a truly entertaining machine. Ask questions Join the 16 Suzuki QuadSport LT-Z50 discussion group or the general Suzuki discussion group. Bikez has reestablished Bikez.info motorcycle web shop overview. Here we present the major online shopping possibilities for motorcycle parts, gear and accessories. This includes customizing and insurance. Search and compare products and prices. Try our 2016 Suzuki QuadSport LT-Z50 discussion forum if you have questions or comments. Information about any technical issue is always welcome.